The G8 is an inter-governmental political forum of the world′s major highly industrialized economies in countries that view themselves as democracies. Collectively, in 2012 the G8 nations comprised 50.1 percent of 2012 global nominal GDP and 40.9 percent of global GDP . The G8 (from 2014 with Russia's suspension) is an inter-governmental political forum of the world′s major highly industrialized economies in countries that view themselves as democracies. Collectively, in 2012 the G8 nations comprised 50.1 percent of 2012 global nominal GDP and 40.9 percent of global GDP (PPP). The forum originated with a 1975 summit hosted by France that brought together representatives of six governments: France, Germany, Italy, Japan, the United Kingdom, and the United States, thus leading to the name Group of Six or G6. The summit came to be known as the Group of Seven, or G7, in 1976 with the addition of Canada. 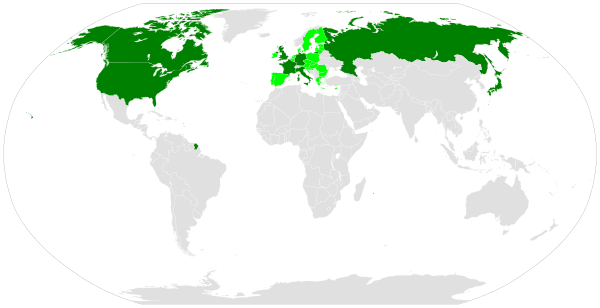 Russia was added to the political forum from 1997, which the following year became known as the G8. In March 2014 Russia was just temporarily suspended following the annexation of Crimea; even if the suspension lasts for several years some G7 politicians and officials stated they would be interested in Russia's return to the group. The European Union is represented at the G8 since the 1980s as a "nonenumerated" participant, but originally could not host or chair summits. The 40th summit was the first time the European Union was able to host and chair a summit. "G7" can refer to the member states in aggregate or to the annual summit meeting of the G7 heads of government. The former term, G6, is now frequently applied to the six most populous countries within the European Union. G7 ministers also meet throughout the year, such as the G7 finance ministers (who meet four times a year), G7 foreign ministers, or G7 environment ministers. Each calendar year the responsibility of hosting the G8 is rotated through the member states in the following order: France, United States, United Kingdom, Russia, Germany, Japan, Italy, and Canada. The holder of the presidency sets the agenda, hosts the summit for that year, and determines which ministerial meetings will take place. In 2005, the UK government initiated the practice of inviting five leading emerging markets — Brazil, China, India, Mexico, and South Africa — to participate in the G8 meetings that came to be known as G8+5; but this practice was short-lived as it was viewed by those states as patronising and insulting. With the G-20 major economies growing in stature since the 2008 Washington summit, world leaders from the group announced at their Pittsburgh summit in September 2009 that the group would replace the G8 as the main economic council of wealthy nations. Nevertheless, the G7/G8 retains its relevance as a "steering group for the West", and special significance for Japan. The G8: Who, Where, What & Why? You've probably heard about the G7 summit. It's an annual meeting of world leaders, where they discuss global issues, and pose for an obligatory photo op. President Obama welcomes G8 leaders to summit at Camp David.